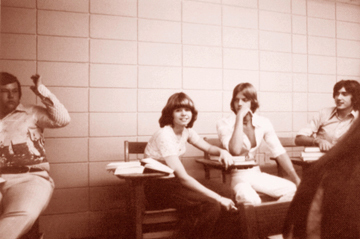 Siobhan McCourt, class of 1977, and Art Copeland pose in this 1976 photo. To the left of them is David Richard Rodgers, a day student from the class of 1976. On the right, Frank Heinz, class of 1976, seems to be enjoying the moment. Photo sent in by Art Copeland, class of 1976.